As an event planner, you know the importance of attracting vendors and sponsors to your events. They play key roles in the popularity of your event and are critical to your success. These stakeholders help you provide quality content, innovative products, and valuable services to your attendees. At the same time, you can generate incremental revenue from vendor and sponsor fees. But to attract paying exhibitors with quality products and services, you need to provide them with a return on their investment. And that can be difficult to do given all the activities at your event competing for your attendees’ time. So how do you help your vendors and sponsors network with your attendees and generate the quality leads they so desperately want? Mobile event apps are the perfect tool to help you connect your vendors and sponsors with your attendees. The convenience and customization they provide allow you to craft a solution that fits your event and makes it easy for your stakeholders to network with your app users. 1) Sponsor Lead Retrieval – This feature makes it easy for exhibitors to manage and qualify the connections they make at your event. 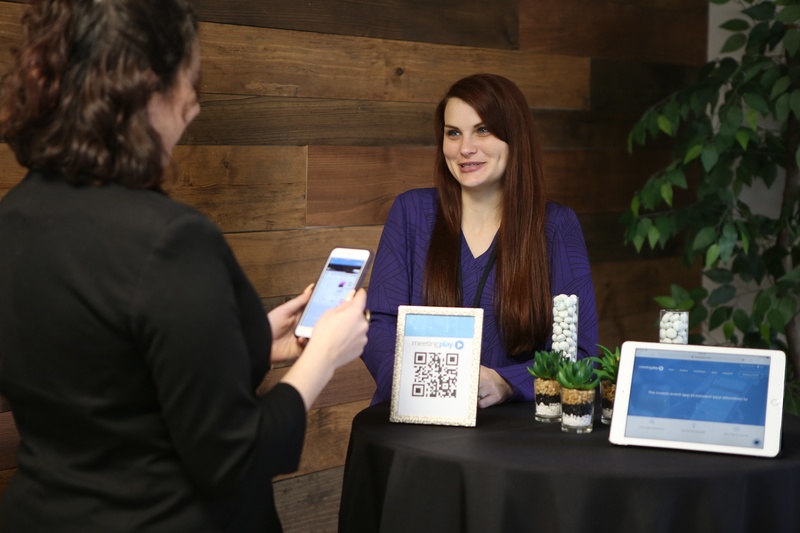 Once an attendee and a vendor exchange information using a scannable QR code, vendors and sponsors can use their event app to make notes, and add connections to a favorites folder. No more fumbling through business cards or trying to remember faces and conversations. 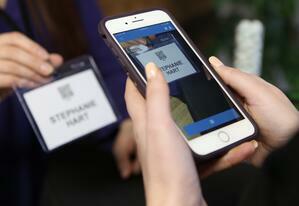 Vendor-to-attendee networking can be made simple and effective with a custom mobile event app. 2) Specialized Vendor Reporting – Your vendors may not have the chance to network and connect with every attendee who stops by their booth. This lack of face time can result in lost leads and missed sales opportunities. But if you’re using the right mobile event app, your sponsors and vendors can connect with potential leads, even if they don’t speak with them in person. By combining Beacon technology with your event app you can provide customized reporting for your exhibitors. You can track the attendees who visited a booth and provide your vendors with information about who visited, how long people waited, and what the overall traffic looked like at their booth during the event. This information allows your vendors to follow up with attendees who slipped through the cracks and maximize the number of leads and connections they make. It’s like giving your vendors a rewind button the day of your event. 3) Vendor Quizzes – Your vendors and sponsors want to do more than exchange information and give away free swag to your attendees. They want to make meaningful connections and have engaging conversations as they network. And you can help them do just that by incorporating gamification efforts into your event. Here’s an example to show you how this works. An attendee scans a vendor's QR code, which takes them to that vendor's profile within the app. This profile includes a quiz with questions that are related to your vendor’s products or services. To answer correctly, your attendee would need to have a conversation with your vendor, rather than just scanning in at their booth with only correct answers gaining points as part of the gamification feature. This drives your attendees to network with your vendors at a deeper level and provides better leads for your stakeholders. You can read more about gamification here. Mobile event apps can transform your event in many ways, including adding value to your vendors and sponsors. Help your stakeholders maximize their leads, create meaningful connections, build a solid network, and get a better return on their investment. Contact us to learn more about attendee-to-vendor networking and the other benefits of using our innovative mobile event app.